When it comes to celebrating love, there's White Day and even Qixi Festival in addition to the widely-known Valentine's Day. May 20th just passed which was another day that's more relevant to modern couples in China. It's known as the Valentine's Day of the Information Age and occurs every May 20 (since 520 sounds like 'I Love You' in Chinese) and May 21 (since 521 sounds like 'I Do'). Fan Bingbing and Li Chen are arguably the most high-profile engaged couple in c-ent right now and they are not one to pass up the occasion. 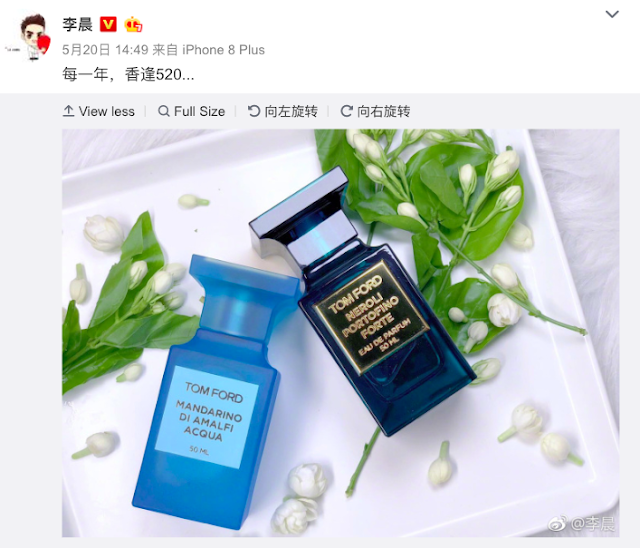 Li Chen posted the Tom Ford perfumes he received as a gift and said, "Every year, 520." Fan Bingbing posted something similar after receiving a giant bouquet of flowers, cake and hand-made purses from her beau. Notice the matchy matchy profile pics, they both changed to that not too long ago. There's no news of the couple's wedding date yet, but you'd bet it's likely to be a grand affair. Fan BingBing is going to be one celebrity who is not going to disappoint with her wedding dress!